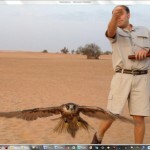 Al Maha’s falcons are rock-stars and live in flash, air-conditioned facilities away from the main resort. 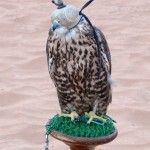 I met two of them the day I watched the falconry display. The information that follows is from the handlers/trainers there. 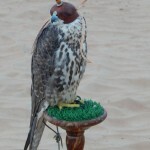 Hoods, jesses & trackers: The hoods are a calming device (dulling the falcon’s senses by 80%) and the tether is a control device to secure the bird when not in flight. 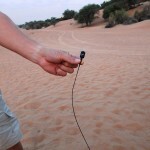 A clip-on transmitter can be used to track/recover the falcon if it flies off and does not return. 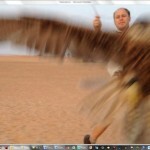 How falcons hunt: Hunting at speed requires massive energy. 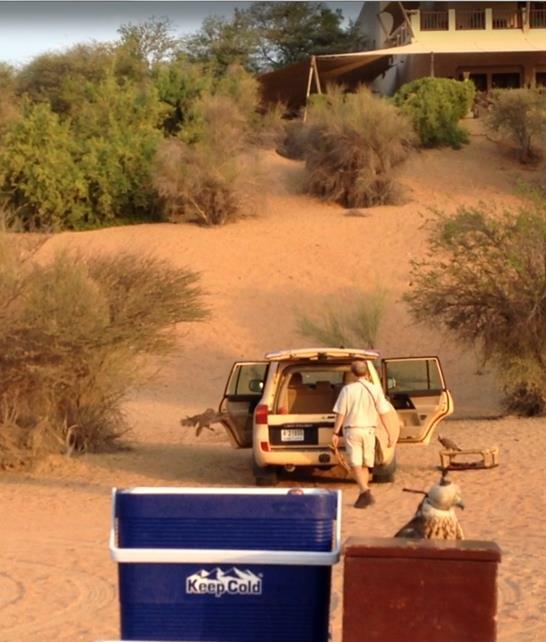 Daily ‘outings’ at Al Maha keep the birds in good physical shape as well as keeping their training primed. They lose that heat by panting and through massive heat emission from their scaled feet. I felt Jazeera’s feet about 10 mins after her flight and they were still roasting. Thanks largely to the massive speed of falcons, their prey dies from the impact of being crashed into (breast-bone first) at 300km/hr by the bird. It’s the equivalent of us being hit by a truck. If it doesn’t kill t hem it renders them unconscious and then the falcon tears it up with their claws and picks it apart with its beak. 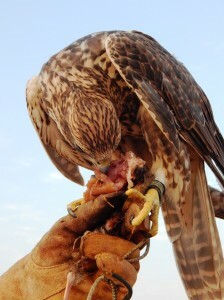 How falcons eat: Falcons eat every part of their (bird) prey including feathers, feet and spines (their crunchy favourite). 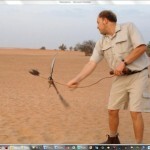 But they don’t eat the very sharp flight feathers. Their throats are lined with one-way barbs which hook food and ‘drag’ it down further into their gullet. 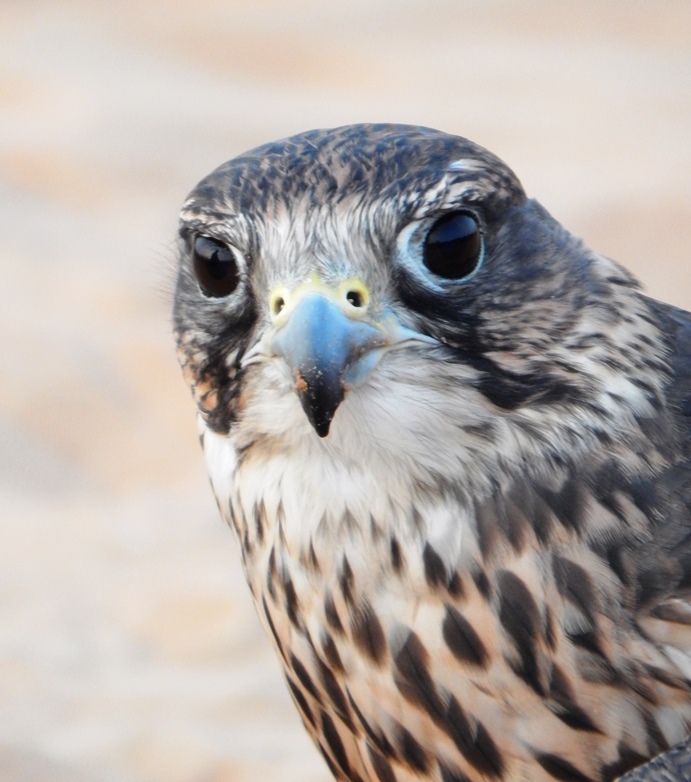 How falcons escape: Captive bred falcons can often get lost because they don’t know the territory they were training in. 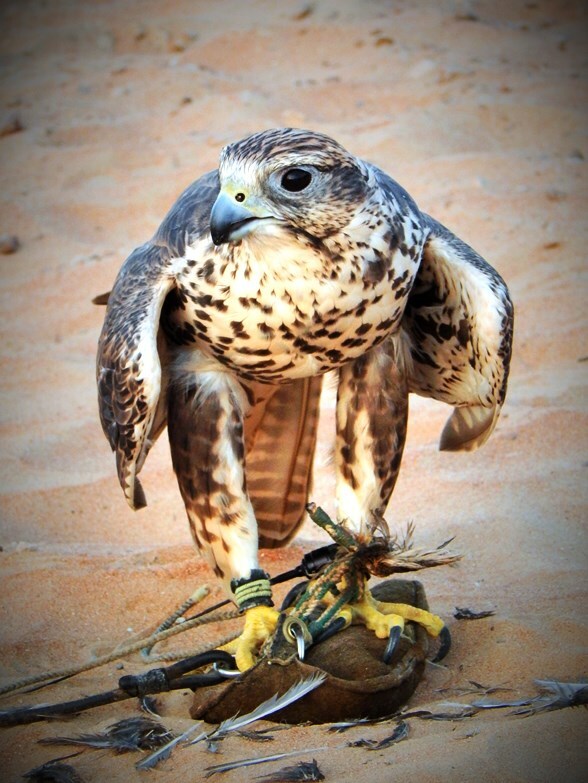 There are healthy bounties on escaped (expensive) birds and so if other falconers in the region get a glimpse of a bird with tethers flying where it shouldn’t be they make quite an effort to recover them, secure them and get them safely home. Meet Jazeera Jazeera is a particularly beautiful female and a deadly, efficient hunter. She was a confiscation taken to Al Maha for rehabilitation and release. But on release day (and subsequent release days) she didn’t want to go so now she lives a life of luxury and has become their star show-pony and hunter. Her colouring is superb (lots of white) and her speed and accuracy are top notch. She is valued very highly and has her own security. Meet Samira Samira would never make it as a falconer’s bird, he’s too fussy in flight and not ruthless as a hunter, though he was originally selected because of his aesthetics. 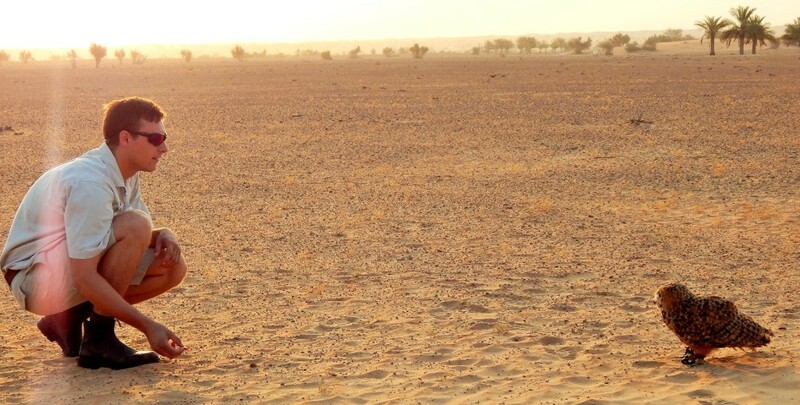 Samira was a gift from Sheik Mohammad, Dubai’s ruler when it was clear he would never be truly competitive as a hunter. 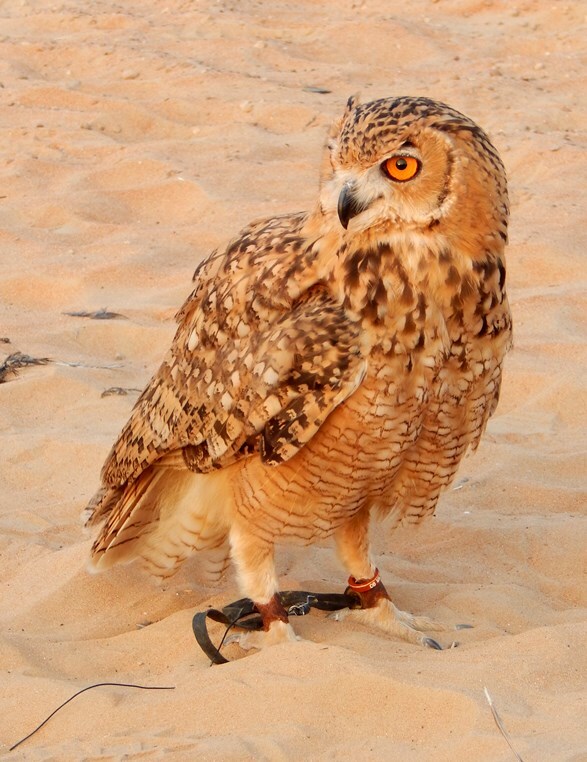 Meet Oscar Oscar is a Pharaoh eagle-Owl who was hand-raised from chick age. I really liked this bird because of his gorgeous face and plumage but also because they told me that he doesn’t hoot because he was never taught how. Poor hootless Oscar. He’s also a pretty average hunter which is why he was given (along with Samira) to Al Maha by the sheik for educational use. He’s actually quite afraid of small creatures. Poor hootless, scaredy-cat Oscar. Pharaoh owls breed for life but because he’s such a dysfunctional owl it’s unlikely he’ll ever get paired with a mate. Poor hootless, scaredy-cat, lonely Oscar. You can see why he was my favourite, yes? When the falcons flew overhead you really knew about it, they whizzed past with an audible and unmistakable whoosh. But Oscar… the first I knew that he was swooping on me was the breeze after he’d already passed by. Complete stealth. Oscar gave Phil and Lawrence a merry chase on exhibition day flying everywhere they didn’t want him to go and putting virtually no effort in. He’s apparently known for it. Unlike the rock-star falcons, Oscar lives with a couple of other birds in an outdoor enclosure which isn’t totally vermin or snake proof, so his handlers believe he probably spent the night picking off wild mice and stuff and hence his total lack of interest in working for his food. Plus it was 5am and so he was probably tired after a long day of…just being Oscar. He did put in some effort twice: once when he swooped past me and launched off on my head (yay! Ow, but yay…) and then when Phil gave up and jogged over to opened the vehicle door. Oscar saw that in his amazing 360 peripheral vision, turned and immediately flew 100m and straight into the back seat of the Landcruiser. Classic. I got it on video but not on camera, here’s a screen shot with him about to get settled in the back left seat. That’s a bird who’d had enough!